Advent is a part of the days leading up to the Christian celebration of Christmas. Advent marks the beginning of of the liturgical calendar, which is the church calendar. Advent starts four Sundays before Christmas, which is December 2 this year. The first half of the liturgical year focuses on the theme "Christ Our Light." This theme is embodied by the celebration of Christmas. 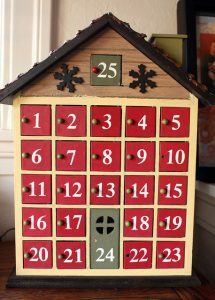 Photo of an advent calendar. Photo taken by Flickr user Wendy Copley. Advent happens during a time when, in the Northern Hemisphere, daylight is short. Some people have Advent wreaths. Candles are used to decorate these wreaths. The wreath contains evergreen branches (like pine), and has four candles, one for each week of advent. There are three purple candles, and one pink candle, which is lit on the third Sunday before Christmas. The pink candle symbolizes "Refreshment Sunday." This Sunday is less solemn than the others in tone. Sometimes there is a fifth candle, that is white, which is lit on Christmas day. These wreaths were used to provide light in the days up to Christmas, and to remind people that "Jesus is the Light of the World." Advent and Lent were considered times to reflect on wrong-doings. Over the years, Advent became a more joyful time; as a part of the anticipation of the celebration of Jesus Christ's birth. Catholics may attend weekday mass and go to confession. All Christians may pray more, and try to practice more patience and tolerance. This helps some people prepare for Christmas; by focusing on the spiritual aspect of the season. Many people have advent calendars. These calendars have parts that open up, and there is one for each day in Advent. Each day they open up a part of the calendar for that day to receive a small gift or candy. At sundown on Sunday, December 1, the windows of many Jewish homes will blaze with light as families begin to celebrate the eight-day festival of Hanukkah. Hanukkah celebrates the victory of diversity and religious freedom over tyranny. In 168 BCE, the Seleucid (Syrian-Greek) ruler was Antiochus Epiphanes IV. He wanted to outlaw the practice of Judaism, so that all of his subjects would share the same culture. As part of this effort, he marched into Jerusalem and vandalized the Jews’ holiest temple, saying that Jews had to practice Seleucid customs of worship, and that practicing Jewish customs was punishable by death. The Jews revolted. They were led by the priest Mattathias (also known as Matisyahu – and yes, that’s where the singer gets his name.) With Mattathias were his five sons, and a tiny army of Jews, known as the Maccabees. The revolt ended in the Jews’ reclaiming and rededicating their central temple three years after the invasion. 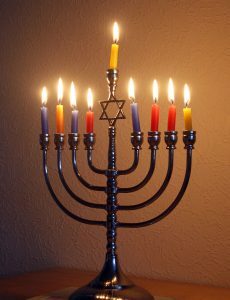 Photo of a Menorah with all eight candles lit for Hannukkah. Photo by wikipedia user 39james. In Hebrew, Hanukkah means “rededication.” A crucial part of the rededication of the Temple was the relighting of the menorahs. Menorahs traditionally burned 24 hours a day, but they had been put out by the Seleucids. To relight the menorahs and keep them burning all day, the Jews needed oil to provide the fuel. The Maccabees found only one jar of oil in the wreckage of the Temple. Nevertheless, they relit the menorahs, and miraculously, the one jar of oil lasted for eight days. This is the reason Hanukkah is celebrated today for eight days. In commemoration of this miracle, Jews light menorahs, adding one candle each night for all eight nights. They eat foods such as latkes (potato pancakes) and sufganiyot (jelly donuts). These foods, fried in oil, are meant to evoke the miracle of the long-lasting oil. Counting the eight nights of Hanukkah is a great way to talk about numbers and addition with little kids. Hanukkah, A Counting Book in English, Hebrew, and Yiddish, is a great way to start the conversation. For a look at various artistic interpretations of the traditional menorah, explore Five Centuries of Hanukkah Lamps From the Jewish Museum. And when you get sick of singing “I Had a Little Dreidel,” you can cue up Happy Joyous Hanukkah. In it, the Klezmatics use recently discovered Jewish lyrics penned by the legendary Woody Guthrie to create a new catalog of Hanukkah music. The Immaculate Conception of Mary is a Roman Catholic belief. It was controversial and debated heavily when it was introduced. Nevertheless, on December 8, 1854, Pope Pius IX, declared in the Ineffabilis Deus that the Immaculate Conception was revealed by God and that all Catholics should believe it. It is often thought that the holiday refers to the conception of Jesus Christ in Mary's womb. However, that is not the case, it actually refers to the Mary's conception. The term immaculate used to describe her conception is to suggest that she was born free of the stain of sin. Mary was conceived the "normal way", unlike her son Jesus Christ. 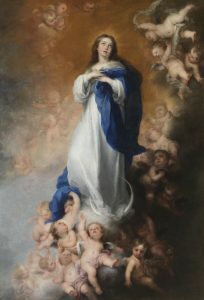 Those against the holiday have argued that the human nature of her conception proves that she could not possibly be free of sin and therefore, could not be immaculate. They say this is because the Bible says that all human beings are born sinners ever since the original sin committed by Adam and Eve in the Garden of Eden. Moreover, this belief is not backed up by Scripture as there is no direct proof of it in the Bible. It is unusual and frowned upon for any idea to be indoctrinated into the Catholic religion if it is not taught in Scripture. Catholics who believe Mary was immaculate argue that references of Mary being "full of grace" in the Bible prove that she was free of sin. They say it implies that she was protected from sin at conception by God's grace. In addition, the fact that she was chosen as the mother of Jesus Christ adds to the belief that she must have been free of typical human flaws. The dogma became more widely accepted after its introduction in 1854. Today the Immaculate Conception of Mary is celebrated with a feast by Catholics worldwide. It is also a holy day of obligation which means that those of the Catholic faith are required to attend mass on this day. Learn more about the Immaculate Conception of Mary with the books below.